What are the Best Online Master's in Biotechnology Programs? What Else Can I Expect From an Online Master's in Biotechnology Program? Biotechnological research and innovation results in useful products and skills that can be used in forensic crime analysis, genetic rejuvenation, renewable fuels, and life-saving medicine. Scientists in this field analyze and manipulate living systems, such as vegetal and animal organisms, to advance research in their subfield or specialization. Students in online master's in biotechnology programs synthesize areas such as chemistry, biology, engineering, and computer technology. A master's degree in biotechnology provides knowledge and skills necessary to pursue careers in industries such as environmental conservation, pharmaceutical development, agricultural engineering, and food safety. The Bureau of Labor Statistics (BLS) projects that jobs in biochemistry and biophysics will increase 11% by 2026, faster than the national average. Columbia is a world-renowned Ivy League research institution highly regarded for its school of engineering and applied science. Its rigorous programs are at the forefront of engineering education and research, and recognized for developing the engineering leaders of tomorrow. The master of science in biomedical engineering is offered fully online through the Columbia Video Network. Online learners have the same challenging classes and assignments, and earn the same degree as their on-campus counterparts. Columbia's online master's degree in biomedical engineering prepares students to find solutions to real-world problems in biology and medicine using engineering and applied science methods. The program fosters interdisciplinary collaboration in engineering and the physical and biological sciences. Applicants for the biomedical engineering online master's program must have an undergraduate degree in engineering, science, mathematics, computer science, or a related field approved by the university's biomedical engineering program. Transfer credits are not eligible. Students must complete all degree requirements within five years of beginning the first course. Founded in 1876, Johns Hopkins is America's first research university, welcoming scholars from around the world to its renowned Baltimore campus. Its applied biomedical engineering program caters to practicing scientists who want to use engineering skills to tackle critical issues in biology and medicine. Engineers and scientists pursuing a master of science in applied biomedical engineering have the flexibility to tailor the program to their busy schedules. They can complete coursework fully online, or online and on-campus. Distance learners can take online courses asynchronously, allowing them to complete work when and where it's convenient for them. Students pursuing the online master's degree in biomedical engineering must complete ten courses within five years, and choose from one of three focus areas: imaging, instrumentation, or translational tissue engineering. They must also complete the biomedical engineering practice and innovation course, which combines online preparation with six days of intensive lab, design, and clinical work on campus and at the Johns Hopkins Hospital. USC, located in the heart of Los Angeles, CA, is one of the world's top private research universities. Its master of science in biomedical engineering program links physiology with engineering science, and prepares students to enter interdisciplinary careers in medical technology. Applicants must have an undergraduate degree in engineering, math, or a hard science from a regionally-accredited university to be considered. The USC program is fully online with the option to visit campus. Online learners view the same lectures as on-campus students through USC's proprietary online platform. The system enables online and on-campus students to collaborate with faculty members in and out of the classroom. Full-time students take about two years to complete the 28 unit online biomedical engineering master's program; part-time students take about three-and-a-half years. Learners can complete the biomedical engineering online master's degree with or without a thesis, and graduates earn the same degree whether they are on-campus or online. Bioengineering addresses today's unmet challenges in biology, health, and medicine. The University of Washington's online master of pharmaceutical bioengineering program prepares students to explore healthcare solutions in exciting areas such as smart therapies for cancer, adaptable prosthetics for amputees, and engineered heart cells for cardiac patients. Bioengineering is the only degree that links engineering, biology, and physical science. This 38-credit fully-online master’s program is ideal for working engineers, scientists, biotechnology, or pharmaceutical professionals. After completing the core curriculum, online learners choose one of two advanced tracks: drug discovery and design or translational pharmaceutics. Students then complete a clinical development capstone course and departmental seminars. The program can be completed within two years. Applicants must have a BS in a relevant science, public health, or engineering-related field. Those with a BS in a non-scientific field must have two years work experience in a related industry. UW will also consider applicants with clinical degrees or those with a BA and prerequisite coursework. Case Western Reserve University is one of the nation’s leading private research universities, only minutes from downtown Cleveland, OH. In 1968, CWRU founded one of the first biomedical engineering programs in the world, and is now highly respected for its innovative approaches to technology. CWRU's master of science in biomedical engineering is offered fully online, and students complete the same curriculum offered to on-campus students. Online coursework is asynchronous and grounds students in the fundamentals of instrumentation and analysis, while expanding their knowledge-base in physiology and specialty courses. Students taking two courses per semester can typically complete the 27-credit online biomedical engineering master's program in about two years. As a practice-oriented program, the degree does not require a thesis. Applicants must have a BS in engineering, and those with a non-engineering degree must show proficiency in calculus and differential equations. CWRU will consider up to six semester hours of graduate-level transfer credits in program-related studies. Colleges and universities must meet certain academic standards to maintain accreditation. However, online biotechnology master's programs differ greatly in outcomes. Some programs focus on general biotechnology, and others specialize in areas such as pharmaceutical bioengineering or immunohematology. Carefully research each potential program to determine whether the curriculum fits your academic and professional goals. Molecular biology: A mainstay of biotechnology master's programs, this course covers key concepts including DNA replication, nucleic acid structure and function, chromosome structure, and the regulation of gene expression. This course provides fundamental training for all aspiring biotechnology professionals, especially those who plan to work as researchers in laboratory environments. Bioethics: Students explore philosophical notions of the moral good, which they apply to case studies and critical issues in the field. Topics include conflicts of interest, peer review, organ transplantation, use of research animals, human experimentation, and in vitro fertilization. This course prepares students for positions working with living subjects. Fermentation biology: This course examines the biological and microbiological systems that transform waste products into useful chemicals. Students explore physiological processes and learn how to conduct conversions in efficient and biologically sustainable ways. Laboratory work includes implementation of bench-scale design and microbial measurements. This course is especially beneficial for students who plan to enter the biofuel and food science fields. Statistical processes for biotechnology: Students learn techniques used in research testing. Learners study motif sequences in genetic expression and regulation and the analysis of sequence homology using information theoretic indices. Students learn to use statistical tools, such as Fourier analysis, long-range correlation, and Markov and Bayesian processes. Learners are prepared for roles as agricultural scientists and biotechnologists, whose work involves number models. Drug discovery and design: Students analyze case studies to understand general approaches to modern drug discovery, including aspects of human biology and disease. The course explores federal laws concerning testing and patent, new discovery techniques, and emergent therapeutics. Coursework prepares students for positions in pharmaceutical development. How Long Does It Take to Get an Online Master's in Biotechnology? Most online master's in biotechnology programs require at least 30 credits and take about two years to complete. Because biotechnology is an interdisciplinary field, required coursework varies widely and affects degree completion time. Most online programs deliver classes asynchronously, but some require synchronous laboratory courses. Some online programs use a cohort structure; students take one class at a time and progress through coursework with a small group of peers. Cohort programs are ideal for working professionals and those with personal commitments, but they generally take longer to complete than individually paced programs. Students who want to graduate quickly should look for programs that offer remote classes, summer terms, and generous credit transfer policies. You may also want to prioritize online biotechnology master's programs that allow you to complete practicum, internship, and capstone experiences locally. To become a certified engineer, candidates must past two exams from NCEES: the Fundamentals of Engineering exam, which costs $175, and the Principles and Practices of Engineering exam, the fee for which varies by state. Both exams are available in various disciplines, including chemical and biological engineering. CfPIE offers numerous professional certifications in the biotechnology and related subfields, including biopharmaceutical development; chemistry, manufacturing, and controls; and medical writing. The certification process requires specialized education, skill training, and an exam. Certification costs $1,950-$2,650, and discounts are available to qualifying candidates. Unlike other professional certificates and licenses, CfPIE accreditation does not expire. 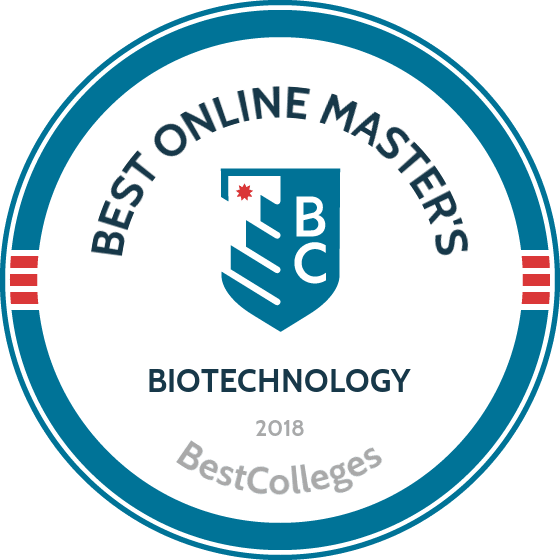 When researching online biotechnology master's programs, look for colleges and universities with national or regional accreditation, preferably both. The U.S. Department of Education (ED) and the Council for Higher Education Accreditation (CHEA) oversee agencies that award national accreditation to institutions that meet certain academic standards. Six organizations recognized by the ED and CHEA award regional accreditation. These accrediting agencies ensure colleges and universities meet standards for curricular outcomes and institutional goals. Employers generally prefer graduates of regionally accredited institutions. However, enrolling in a school that holds both national and regional accreditation ensures your degree will be universally recognized. Master's in biotechnology programs may also hold specialized accreditation from field-specific organizations, such as the American Society for Biochemistry and Molecular Biology and the Accreditation Board for Engineering and Technology. The ED ensures schools adhere to federal regulations in return for lobbying privileges and funding. CHEA is a private, nonprofit organization with more than 3,000 member institutions that must meet the council's standards for academic programming and professional development. Member schools enjoy institutional support, including policy advocacy, research and education initiatives, and financial incentives. Visit the ED and CHEA websites for lists of accredited online biotechnology master's programs. The table below highlights five potential careers for graduates of biotechnology master's programs. Generally, salaries for professionals with a master's in biotechnology increase with professional experience. Because biotechnologists work in diverse industries, certain positions require specific training and certification or licensure. Additionally, professionals pursuing high-ranking leadership positions typically need a doctoral degree. After earning a master's in biotechnology, graduates can pursue professional opportunities in diverse industries, such as agriculture and biomedical engineering. Biotechnologists study and synthesize living systems to expand human understanding and to create products that improve quality of life. These professionals need expert knowledge of cell systems and chemical reactions and advanced skills to apply this understanding to complex analyses. Biotechnologists often pursue self-directed work as laboratory technicians or collaborate as part of research and development teams. These professionals work predominantly in the healthcare industry. They use biotechnology knowledge and engineering skills to design and implement devices, equipment, software, and hardware systems. Many biomedical engineers work as researchers and on development teams to ensure new products and services meet company standards and improve patient care. Though some biomedical engineers have only a bachelor's degree, many positions require a master's of biotechnology. These biotechnologists conduct research to improve the quality and efficiency of agricultural products and establishments, including small-scale animal husbandry and industrial farming operations. Food scientists often lead teams that develop horticulture methods and assess safety standards. These professionals must have at least a bachelor's degree, but many food scientists earn a master's. These scientists study microorganisms -- such as fungi, algae, parasites, viruses, and bacteria -- to understand how they live, evolve, and interact with their environments, including living hosts. These professionals must have extensive laboratory testing experience and computer analysis skills. Microbiologists work in diverse industries, including health science and industrial settings. Most microbiologists earn at least a master's of biotechnology, and some pursue a Ph.D. to teach at the university level. Also known as zoologists, these professionals monitor and conduct human examinations of animals to understand physical characteristics, behavior, and how animals interact with ecosystems. Wildlife biologists need expertise in modeling software and geographic information systems used to track migration patterns and human impact on wildlife populations. Entry-level wildlife biologists need only a bachelor's degree, but high-level positions require a master's degree. These professionals examine the physical and chemical properties of living organisms along with disease, heredity, cell growth, and other biological processes. Biochemists and physicists work in diverse industries and apply research to develop effective drugs, medical treatments, food products, and biofuels. Most positions require a master's degree. Students in online biotechnology master's programs can benefit from membership in professional organizations. Many professional organizations require an annual fee, but members have access to support, networking opportunities, research grants, and career resources and job boards. Professional organizations connect students and professionals in the field, fostering shared knowledge and collaboration. ACS comprises more than 150,000 members in 140 countries and is the premier organization for professionals in the chemistry and biotechnology fields. The organization advocates for sustainability and policy changes and provides awards and a career support center for members. AIMBE is a nonprofit organization dedicated to advancing the medical and biological engineering fields through education, research, and advocacy. Members enjoy funding opportunities, career guidance, and the opportunity to join the College of Fellows, a council of leading experts in biomedicine and technology. Founded in 1968, BMES fosters growth in the field through global programming, licensure, and certification. Members can participate with local BMES chapters and can pursue professional development opportunities including webinars, annual conferences, and career circuit events. BioSpace provides extensive professional development support for professionals in the life sciences and engineering fields. The organization offers a job board, career events across the country, and company profiles that inform job seekers about potential employers. BIO advocates for partnerships between biotechnology companies, academic organizations, and individual professionals. Members have access to policy committees, conference discounts, and skill-training programs. BIO provides discounts on related materials and services for entrepreneurs starting businesses. When researching online master's degree in biotechnology programs that align with your professional interests and goals, consider affordability and funding options. Begin by completing the Free Application for Federal Student Aid (FAFSA) to determine whether you qualify for federal scholarships, grants, work-study programs, and loans. Also apply for awards from professional and community organizations, such as Graduate Women in Science and the Society for Integrative and Comparative Biology.